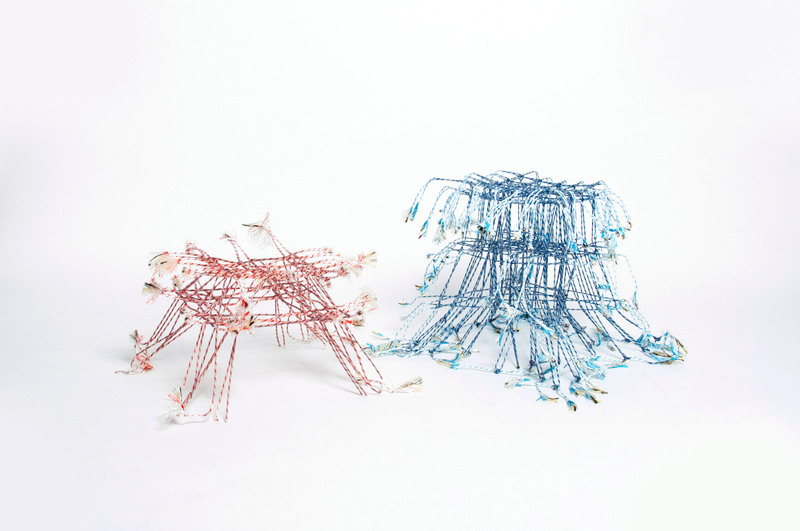 Design Academy Eindhoven graduate Fransje Gimbrere has used a combination of natural and synthetic yarns to construct a collection of freestanding sculptures. 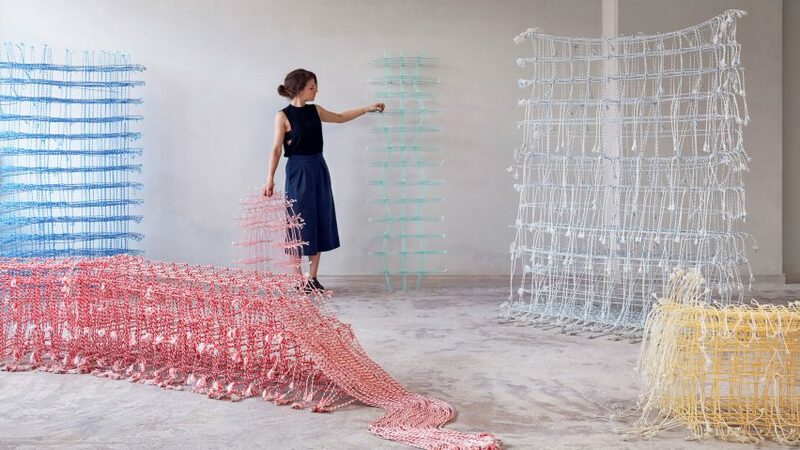 Presented at this year's Dutch Design Week, the aim of Gimbrere's Standing Textile project was to shift the perception of textiles as being "old-fashioned", by instead demonstrating its alternative uses as a building material. "I wanted to shine a different light on textile and textile crafts by using it in the interior in a different way than solely as upholstery," she told Dezeen. 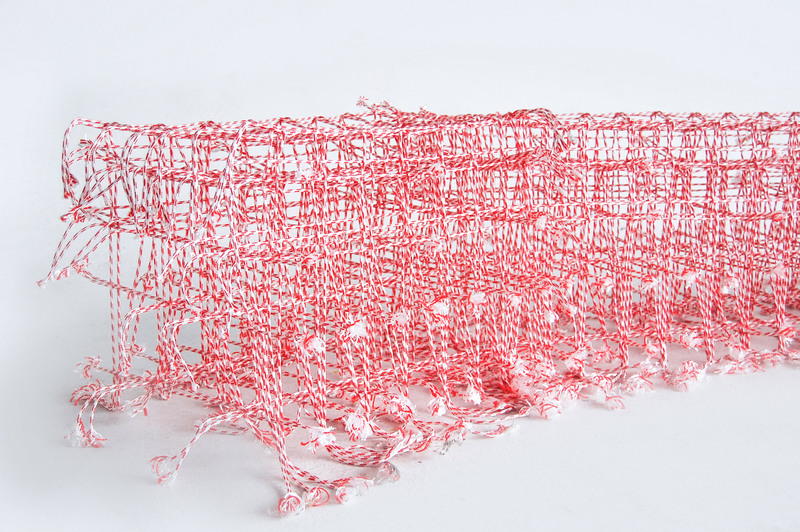 "By weaving these textile sculptures, I'm proposing the idea of textile as a beautiful new building material with endless possibilities in [its] application," she continued. To achieve this, the designer chose a selection of natural fibres including bamboo, linen or cotton, and synthetic yarns from recycled plastic bottles, which she used to create three-dimensional volumes woven thread by thread on a custom-made weaving loom. This process allowed for many different shapes, textures and applications – for instance, a structure that is meant to be sturdy could be made using plastic fibres, whereas cotton or linen threads would be used to create a flexible piece. "For different looks and identities, I use different materials. The material can also be chosen depending on the purpose of the product. Does it have to be strong and sturdy, or more flexible and playful?" she explained. 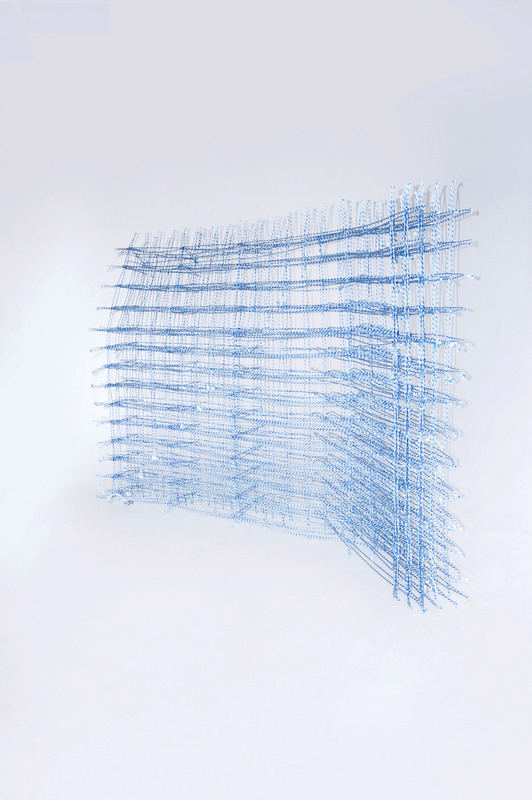 Each structure was built experimentally on the spot and sealed with bio-resin to retain the position of each thread. 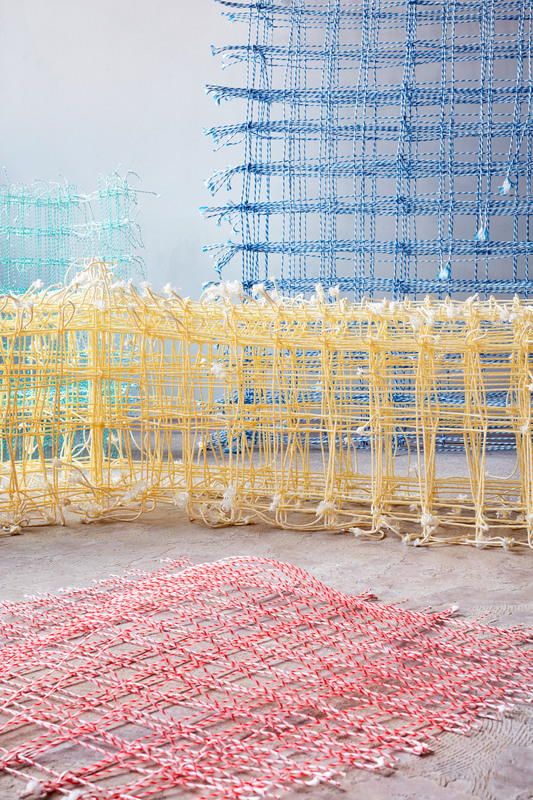 "For the colourful pieces that I presented during Dutch Design Week, I used the synthetic yarns to make strong vibrant ropes and sealed them with bio-resin," Gimbrere said. 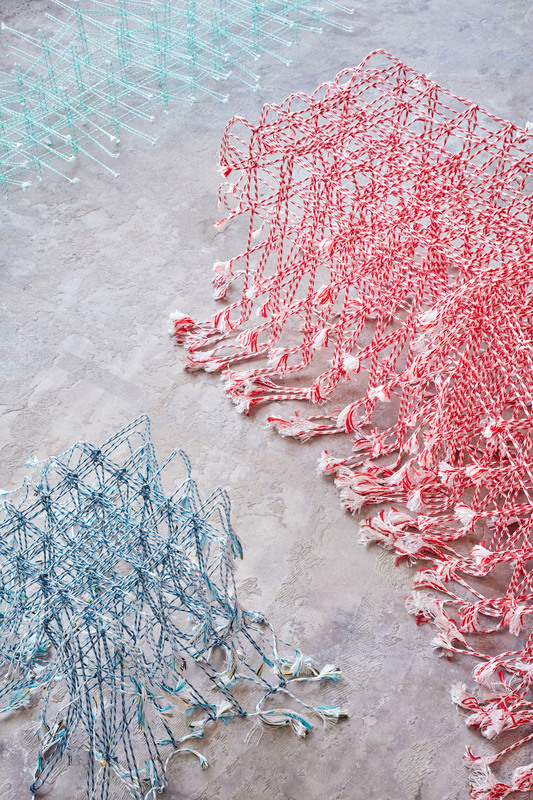 Gimbrere found that this process resulted in structures that looked fragile but were in fact robust. "The desire to bring textile into the interior in a different way than we are used to, resulted in a technique that creates fragile looking skeletons, that give the suggestion of a solid volume," she said. "A lack of support and hollowness make them seem on the edge of breaking though their structure is strong and sturdy," she explained. "Therefore, they can not only carry themselves but also the human body." As well as functioning as decorative installations, the textiles could also have practical uses and be used as room dividers. "Not only does the design have a great decorative function, with a repetition of overlapping lines that plays beautifully with light, but it can also be used for installations as architectural upholstery and for interior objects in private and public space as well," said the designer. "In open workspaces, for example, the open structures can function as dividing walls, giving an idea of demarcation without diminishing the sense of space," she continued. 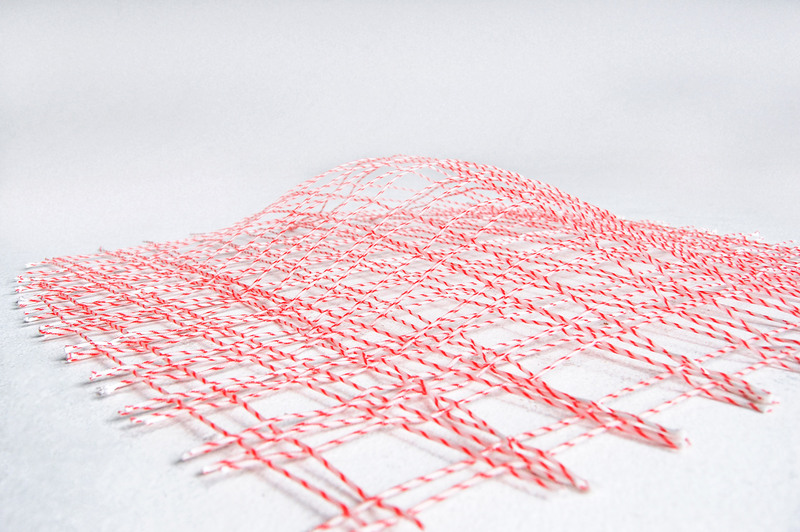 During this year's Dutch Design Week, which took place in October, many designers presented projects that included innovative uses of textiles, including a thermochromic tapestry that changes colour in response to Wi-Fi. Material manufacturer Low & Bonar also collaborated with 10 designers to create a set of products made from non-woven Colback textile.